It’s interesting what themes and patterns emerge when assembling compilations of an artist’s work. Jacob T. Swinney previously examined the roles that sound effects play in Tarantino’s films and how those can tie together a diverse filmography. Now, Swinney has turned his attention to the visual stylings of Sofia Coppola, noticing the way that characters often move, dreamlike, through the world that mirrors whatever dilemmas and crises they are going through in her films. There are frequent repeated shots (for example, looking outward through a window at a world passing them by) and a reliance on natural lighting throughout all of Coppola’s films that bring together her signature approach to storytelling and filmmaking. What defines the Sofia Coppola aesthetic? Is it the sublime use of soft and natural lighting? Is it the subtle pastels of the color pallet? Maybe the handheld camera that dizzily floats around the characters? All of these visual characteristics work together harmoniously to create Coppola’s distinct dreamlike atmosphere. However, the aesthetic reaches far beyond the idea of a visual trademark—Coppola’s atmosphere seems to mirror the inner workings of her characters. As Charlotte ponders a fully-realized life in Lost in Translation, the camera stutters around her in a circular motion. She is washed away, her clothing blending into the matching surroundings. In The Bling Ring, the silhouetted bandits streak across the glittery horizon as they chase their gaudy and tainted desires. In Marie Antoinette, the fanciful nature shots portray a longing for freedom and self-fulfillment. Coppola crafts these dreamscapes to show us not only who her characters are, but who they want to be. The video is aided by music used in Coppola’s films that underscores that dreamlike quality and fascination with characters wandering seemingly aimlessly trying to find their role in the dramas unfolding around them. 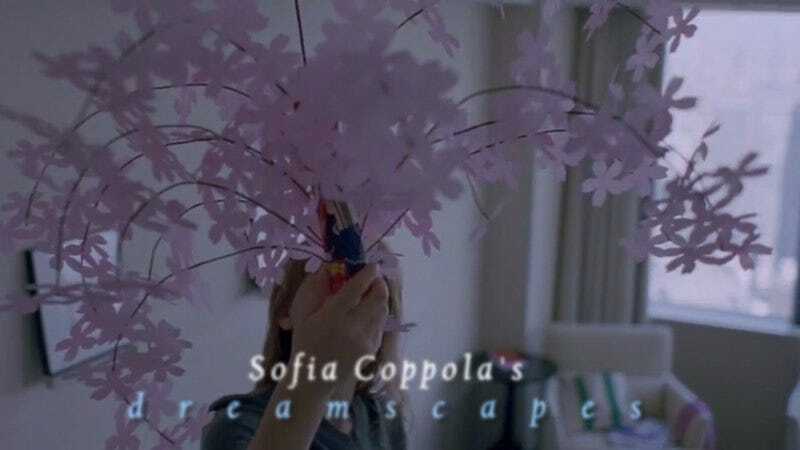 Sofia Coppola’s Dreamscapes from Jacob T. Swinney on Vimeo.